June 1, 2018. 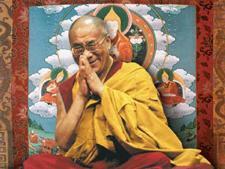 Thekchen Chöling, Dharamsala, HP, India – Eighty people from three different groups met His Holiness the Dalai Lama today. 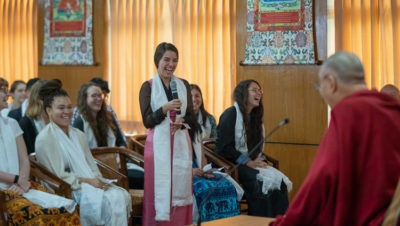 They included students and faculty members from Emory University, Atlanta, Georgia, USA, as well as participants in the Emory-Tibet Partnership from the Library of Tibetan Works and Archives in Dharamsala, and students involved with the Kurukul Program of the Foundation for Universal Responsibility, New Delhi. His Holiness welcomed them to Dharamsala, which he described as his second home for the last 59 years. He outlined his four main commitments, explaining that the first is to promoting an understanding of the oneness that unites all 7 billion human beings alive today. He mentioned not only the interdependence of the global economy, but also how we are all affected by common concerns like climate change. Noting that the fundamental message of all major religious traditions includes the importance of cultivating friendship, love, tolerance and self discipline, His Holiness is committed to promoting inter-religious harmony. Consequently, he expressed regret at the level of religious conflict that can be seen today. “Look at India,” he said, “where religious harmony has been thriving for thousands of years. In addition to indigenous traditions, there others from elsewhere. Followers of Zoroastrianism, for example, originally came from Persia and their community now numbers fewer than 100,000, mostly in Mumbai. But they live there completely without fear. That’s the Indian tradition. “Then, as a Tibetan, someone in whom 6 million Tibetans have placed their trust, I have a moral responsibility to help them as best I can. I semi-retired from my political role in 2001 and completely retired and devolved those responsibilities to an elected leadership in 2011. Now I’m committed to working to encourage the protection of Tibet’s fragile environment. This involves more than the well-being of six million Tibetans because, as a Chinese ecologist has observed, Tibet’s influence on global climate is equivalent to that of the North and South Poles. That’s why he referred to the Tibetan Plateau as the Third Pole. Almost a billion people across Asia depend on water from rivers such as the Indus, Ganges, Brahmaputra, Salween and Mekong, all of which rise in Tibet. If the snow on the mountains of Tibet disappears, millions of Indians will suffer the consequences.” His Holiness also expressed his dedication to keeping Tibet’s language and its rich cultural and religious heritage alive. He explained how the Buddhist traditions of Tibet were drawn from those upheld at the Nalanda University in India. They included a strong reliance on reasoning and investigation, which corresponds to a scientific approach. His Holiness answered several questions from the audience related to creating a more compassion society, dealing with adversity, making positive use of technology and coming to terms with death. He also advised the Buddhists in the room to take a 21st century approach to their faith by developing a reasoned understanding of who the Buddha was and what he taught. The meeting ended with members of the various groups gathering around His Holiness to have their photographs taken with him, after which everyone dispersed for lunch.